Who else is really excited for Christmas this year? I know some of you are because I’ve already heard you talking about it and pinning ideas like some Tazmanian devils. I’m SUPER excited this year, so I’m going to kick things off right with a giveaway! Would you like to win one of these pretty little signs? How about two? Allrighty, just suffer through skim over enjoy my attention whoring story first, then I’ll tell you how you can win! Earlier this year after the holiday season died down and all the decorations were tucked back in the attic I had an email pop up in my inbox that I never expected to see. 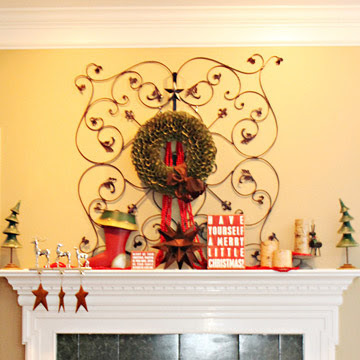 It was an editor at BHG.com asking to feature my Christmas mantel on the Better Homes and Gardens website. But I seriously squee’ed and did a little happy dance in my chair. 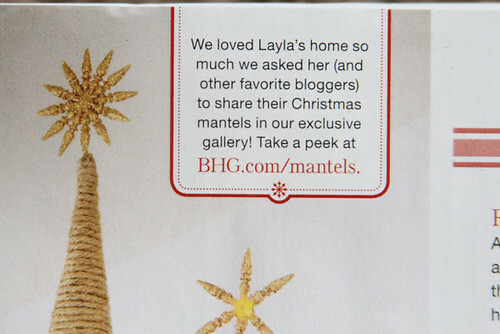 Apparently there is a person who works for BHG who just scours the internet looking for blogs to feature. Something about my mantel caught her eye when she was sifting through the frajillion other gorgeous mantels at The Lettered Cottage Christmas mantel link party, and I was chosen as one of the lucky few to be featured on the BHG “Real Home Christmas Mantel Decorating” slideshow. 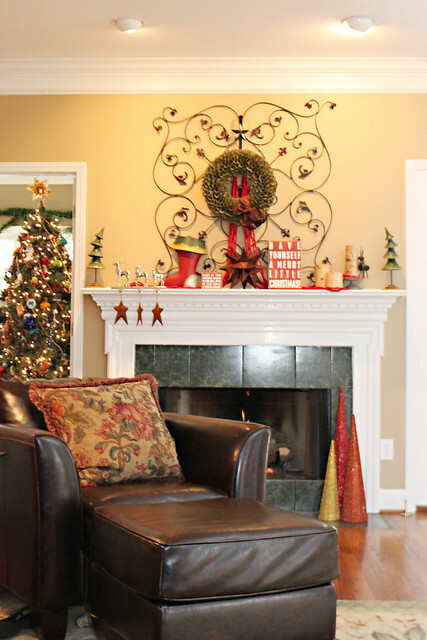 THANK YOU, Better Homes and Gardens for choosing my mantel to be on your website. And THANK YOU to Layla and friends for hosting some seriously popular link parties! Flipping through the other mantels, I feel like mine is just a Freshman band geek trying to walk the hall with the Senior cheerleaders. Not to mention the fact that the picture is all blurry because my lens pooped out on me after our Vermont vacation last year. Of course my new lens that I asked for bought myself for Christmas hadn’t arrived yet. I kinda want to hide from embarrassment and ask for a do-over on that pitiful fuzzy photo. I swear I can do better than that, BHG! Instead I’ll just laugh and say Attention all Bloggers, take note! Always post only your very best images on the innerwebs. You never know when your favorite magazine might come a-knocking asking for a copy for their website. Oh, and it might be a good idea to check underneath your furniture for any toys/ socks and random Crocs that might be lying around or your picture might get cropped into oblivion. DOH. Martha Stewart I ain’t, people. Seriously, though, I cannot tell you how honored I am to be a part of this slideshow. It’s exciting and blush-inducing all at the same time. Maybe I should have submitted this photo instead. Or this one! Ehwell. Too late now. Fuzzy McCropperson it is. 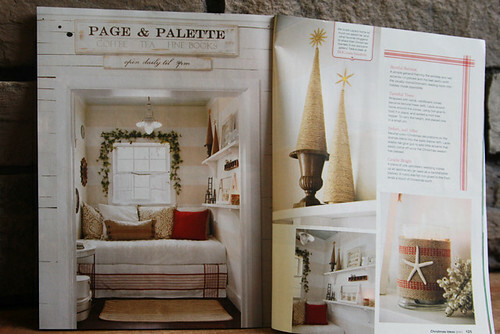 Fast forward to a few months ago, when the new 2011 BHG Christmas Ideas magazine came out. Have you seen it yet? Of course I ran to Walmart when I heard it was out and bought a copy for myself. 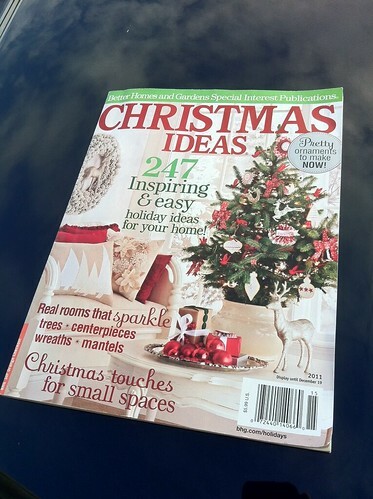 I was so excited to see two of my favorite blogs– Centsational Girl and The Lettered Cottage– featured in all their shiny paged glory with some fantastic decorating ideas. YES! It’s like six degrees of Christmas mantel separation! I’m almost famous! This is the closest I’ve ever been to making it into a magazine before, so I am going to be the big dork who posts just the picture of the link to my picture in the slideshow.. Hey, I might even give my mom an autographed copy. So, thank you for letting me toot my horn for a minute. 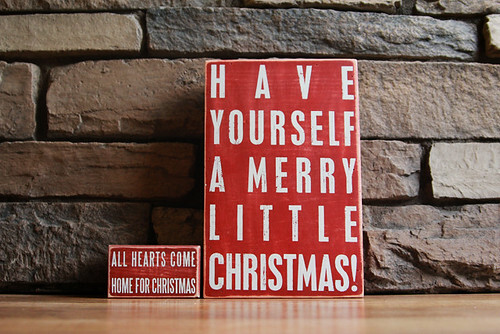 And in honor of all that excitement, I’m a-gonna have myself a merry little Christmas giveaway here on the old blog! 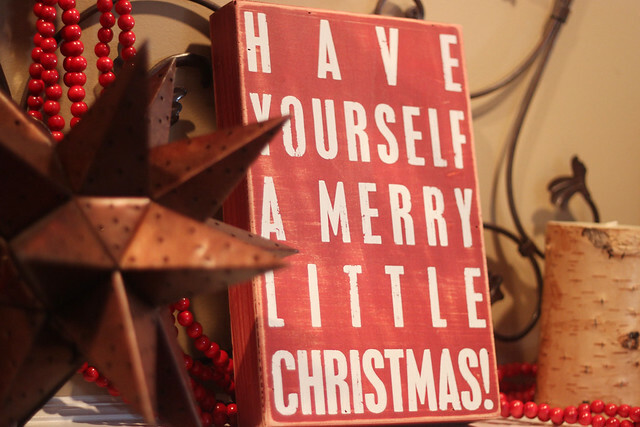 This week I’m giving away TWO sets of these Christmas signs that you can use to adorn your mantel this year, or regift to your Mother-in-Law. Whatever. You decide. Giveaway #2: And a second someone else will win these two signs right here! 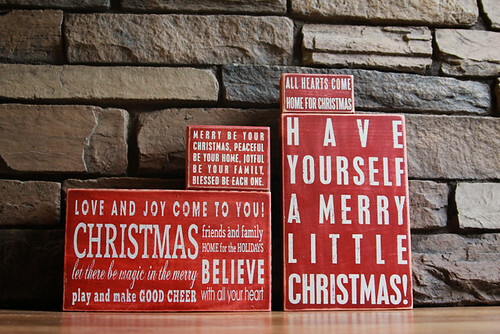 I’m excited to see these pretty little pieces of typography bring some holiday cheer to two of your houses this year. They are made by Primitives by Kathy. I like all her stuff! Just post a comment below to be entered to win. Earn one additional entry by liking Unskinny Boppy on facebook. Don’t forget to report back here and leave a comment telling me that you hit me up or be sure to let me know if you’re already a facebook friend. I’ll let random.org choose two winners for me on Wednesday, November 16th at 8:00 pm CST. And try not to shat in your pantaloons if you are the winner, mmkay? « More New Living Room Paint- Third Times A Charm! 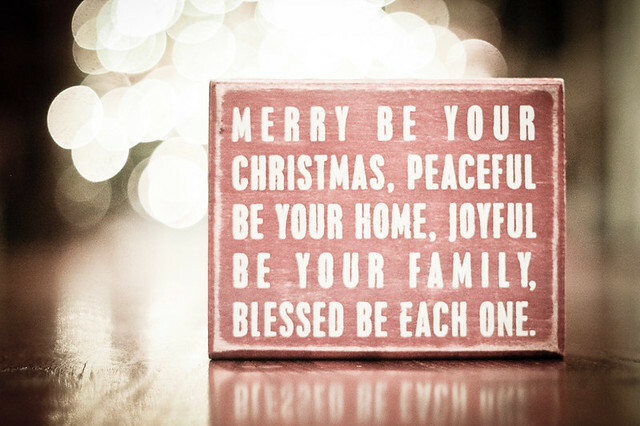 Love your mantel picture and cute little signs 🙂 would love to have those in my home!! I totally love your style (and personality). And if you made that wreath, PLEASE do a tutorial. I love it! I absolutely love these! I would be thrilled to win either one of them. 🙂 Happy Holidays to come! You know I love your style! And you! Oh and I’m a fan of yours on FB! I would love to win this, seeing as I pinned it long ago and will (and most likely fail) attempt to make it myself if I don’t win. Congrats! That is so exciting. (excuse me while I pin your mantel!!!). Would love to win this. Thanks!! I would love to win a set of these! LOVE the look! I know famous people! :bowdown You have this Christmas thing down! I would love (love) the first set! As-in, if I had them, I might keep them up year around. Love your blog!! :-). And super love the mantle!!! Oh! I’ve been following you on FB for a while now!! Fun!! I’d love to win. I love that picture of your mantel! HEY!! That’s you that’s you that’s YOU – AWESOME!~!! You go girl!!!!! …and I like you on FB 🙂 …and I like you for real! I would love to win these. I would prop them up in my kitchen. your house is beautiful!!! If I won, my house would have have a small piece of your wonderful design, sadly it would still never look like yours though!!! Oh and a big congrats on your mantel on BHG, how exciting!!! 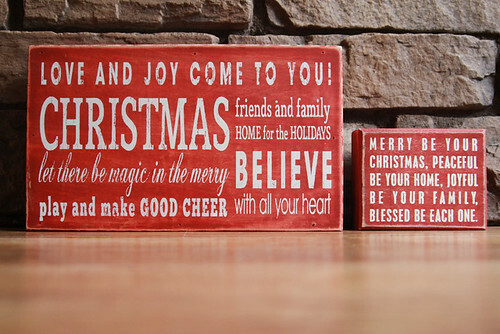 Love the signs and your mantel! I just popped over and liked you on Facebook, too. Congratulations. You do such great decorating. I love this! We don’t have a mantle in our new home and we’re trying to figure out where we’ll hang our stockings and how we will decorate this year. I love your style! I found your blog through pinterest, and I just love, love it. You have such a great style. I think your mantle is so cute, by the way! I’m crossing my fingers for a couple of really cool signs! I like Unskinny Boppy on FB! 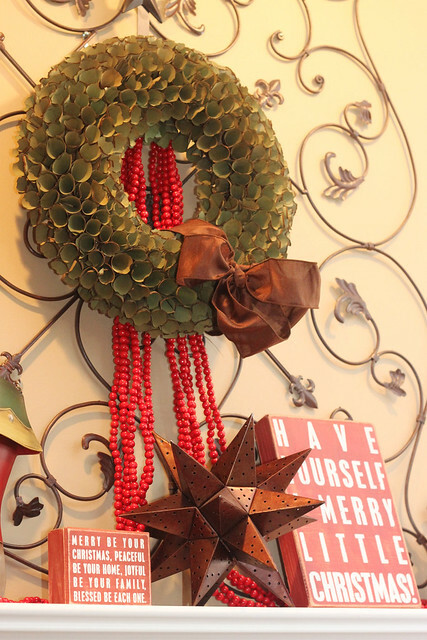 Love your mantel, thank you for this great giveaway! So exciting!! I love your mantel, and I haven’t gotten one of those magazines, but just might need to now 🙂 Would love to win one of these!! 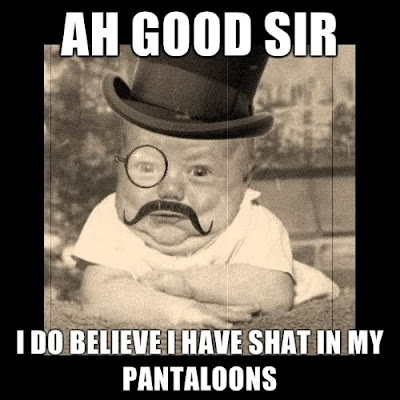 I TOTALLY would have shat in my pantaloons!!!! Congrats, that’s super exciting! Oh yeah, I’m already a FB stalker. If your’s is a freshman attempt, I guess mine would be pre-school. Congrats! Found you from Pinterest. Great blog.